I love tomorrow but I need to live bigger today. Live big, like the lights could go out at any time. That’s what I told myself as I kicked myself out of the house and down to the Ithaca Commons where, at noon on this Valentines Day, One Billion Rising dance to end violence against women. 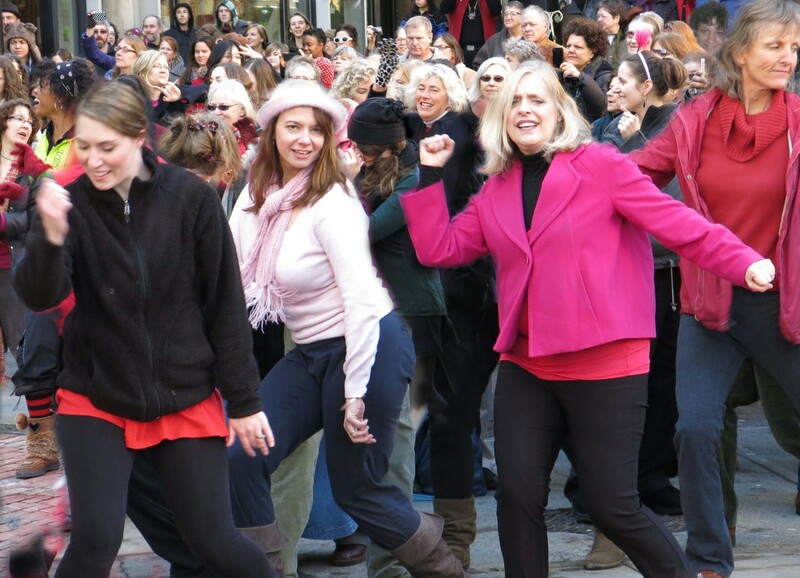 On the Ithaca Commons on Valentines DayOne Billion Rising people around the world were to dance in a demand to end violence against women. “I was fragile, yet strong, among all of the smiling faces around me making a pool with me in the center of all the surrounding energy.” Marika had written this who knows how long ago. They were the last written words of hers that I found. Scrawled at the top of a new page, there was nothing written related to it on the page before, and nothing after. It was like she was just beginning a new story. When I first read it, it seemed a sweet place to “leave her,” a fresh strength in the midst of smiles and good energy. I can put the memory of my daughter anywhere; I have the power to link her to anything. So last year when I discovered these words, I decided to look for her, to plant her, whenever I’m at a gathering like a concert or a festival. In my mind I would put her bright beaming face among the masses of cheerful engaged people. Suddenly, out of the crowd comes Marika’s friend, Florence. She stands at my feet, looking up at me, sparkling and grinning. She could have ignored me, easily pretended I wasn’t there and just gone on with whoever she was with. But she came over to say hello and share a few words. My insides melted. She disappeared back into the crowd just before everyone snapped to attention. The dance began and I buried myself into my camera. There was a moment of silent stillness as mittened and gloved hands hovered overhead pointing to the sky. Then waves of crimson and scarlet, magenta and deep maroon peaked and plummeted. I fumbled, mistaking the shutterspeed dial for the focus button. Wool and quilted-nylon-wrapped bodies twisted and swirled. Highlighted faces flashed in the shadows of buildings. I zoomed my focus in and out and back as people swayed and swooped right and left. For four and a half frenzied minutes I squinted over my camera trying to capture the whole dizzying scene. Then it was over. The music quieted and the crowd crept away. I slid my face from the camera and stepped back down to the cold colorless concrete. Barb and friends hustled me off to have lunch. But I finally looked back at the emptied Commons and realized this was exactly where Marika would have been. Marika, the protester of all injustices since she was a toddler, would have been right in the middle of it all, wearing her red scarf. And I missed my opportunity to search the masses and imagine her there. But I still had the tiny plastic chip in the camera. The chip that captures and contains so much of what I miss. The chip that can reproduce a billion rising memories in tiny thumbnail scenes that I can erase or enlarge, copy or print out. I need to push myself out more. Zoom in on the here-and-now. So I can live bigger and see more of life as it rises around me. This entry was posted in 2013 on 2013/02/18 by Robin Botie.